At Barilla, we care about everyone, regardless of race, religion, belief, gender or sexual orientation. Our mission is to help people – every single person – live better, by bringing wellbeing and the joy of eating into their everyday lives. Rimer’s riff emerges from a larger hashtag trend that formed around #BoycottBarilla and #BoicottBarilla. 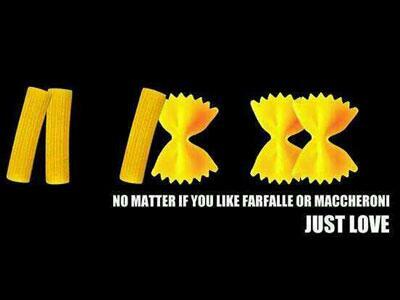 The visual creativity was stunning, not quite on the scale as the marriage equality meme we wrote about earlier but still a great showcase of humor and sarcasm in light of Mr. Barilla’s original remarks. Here are some of our favorites. Some of the earliest ones we noticed were pictures of Barilla pasta boxes in the trash and photos of alternative pasta brands. One couple even made their own pasta in protest. These images are important as they helped normalize a behavior and provided a simple, actionable response that could be easily shared on social media networks. Given Barilla’s popularity, most families have at least one Barilla box in their pantries. Things got interesting when remixes of Barilla box logos and pasta started popping up. Some of them were quite clever, using pasta as a metaphor for love and partnership. Vladimir Putin of course had to make an appearance. Remixing Putin into gay images has become something of a meme in response to the Russian government’s continuing intensive crackdown on the queer community in the nation. The incredible variety of memetic images and the overall response from the international community of gay rights supporters are a testament to just how strong the community has grown on social media. It took just a few days–three really, if you only count business days–and Mr. Barilla shifted from a blanket statement against gay families to a video apology. “Everyone has the right to do what they want without disturbing those around them”. But then the pasta magnate upped the ante by attacking gay adoption. “I have no respect for adoption by gay families because this concerns a person who is not able to choose,” he said. The most-prominent petition was launched by Dario Fo, an Italian Nobel Prize winner, director, and actor who starred in Barilla’s first TV commercials, where he saw first-hand how the brand was “synonymous with Italy, with home, and with family.” The petition asks Barilla to “return to the spirit of those commercials” and “a voice of the present” by producing advertising that includes gay families. By noon Monday, more than 54,000 people had signed the petition.